If you have installed the program, Windows Live Essentials (Version 2009) on your Windows 7 OS and have been using the MSN Messenger or Windows Live Messenger (WLM), you must have noticed that the main contacts window of the MSN Messenger, conversation windows of all chats and display picture have a full fledged icon or button on the Windows Taskbar. Even when you minimize the MSN Messenger, the main contacts window icon remains on the Windows Taskbar rather then being placed within the notification area or system tray. In other Windows OS such as Windows Vista and XP, WLM main contacts window has its icon in the notification area which is generally known as the “System Tray” and is located at the right end of Windows Taskbar right next to the clock, whereas the chat/ conversation windows (whenever opened) have their respective icons on the Taskbar. However, Windows 7 has the WLM icon removed from the notification area and instead shows it in the Taskbar along with the other chat/ conversation windows. The icon for WLM main contacts window in the Taskbar does not go even when you minimize WLM. Moreover, when move your mouse pointer over the WLM icon on the Taskbar, you get a thumbnail preview that shows two confusing WLM Windows among which one is the actual WLM main contacts window whereas the other is one is the display picture. Nevertheless, it is possible that you make some settings so that WLM reverts back to its classic style. 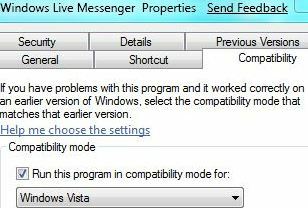 You need to simply run WLM in Vista compatibility mode within Windows 7 so that the WLM icon, whenever minimized is placed in the system tray. Close MSN Messenger or Windows Live Messenger completely by right-clicking on the WLM icon in the Windows Taskbar and selecting “Exit”. Click on the “Start” button to display the Start Menu. Now, locate the shortcut of “MSN Messenger” or “Windows Live Messenger”. It is also possible that you go directly to the actual Windows Live Messenger program, i.e. msnmgsr.exe. You will normally find it at the location “%ProgramFiles%\Windows Live\Messenger\ folder”. 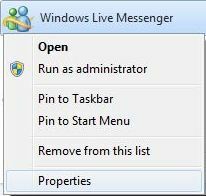 Next, right-click on the shortcut or executable of Windows Live Messenger. You will see the right-click context menu. Select the option “Properties” from the menu. Click on the tab “Compatibility”. Under the section “Compatibility Mode” tick on the checkbox that corresponds to the option for running WLM program/ application in a compatibility mode for the selected OS. Also select “Windows Vista” as the OS from the drop-down box placed below. Finally, run your WLM to check whether the trick has worked. Now you will notice that, whenever you minimize WLM, the WLM icon will be placed in the notification area or system tray.